Top of my list of considerations when contemplating the “unwritten” (or pre-cooking) part of any recipe are my cooking receptacles, deserving as much deliberation when creating a dish as the ingredients. While I have a well known weakness for heavy stainless steel, cast iron and porcelain used from preparation to serving and everything in between, I am not in any way implying that you require an armoury of kitchen equipment to be an efficient or competent cook. You only actually need a few well curated items to make and serve just about anything, preferably ones that look as fabulous in the oven as on the table (and eliminating the need for any superfluous serving ware). 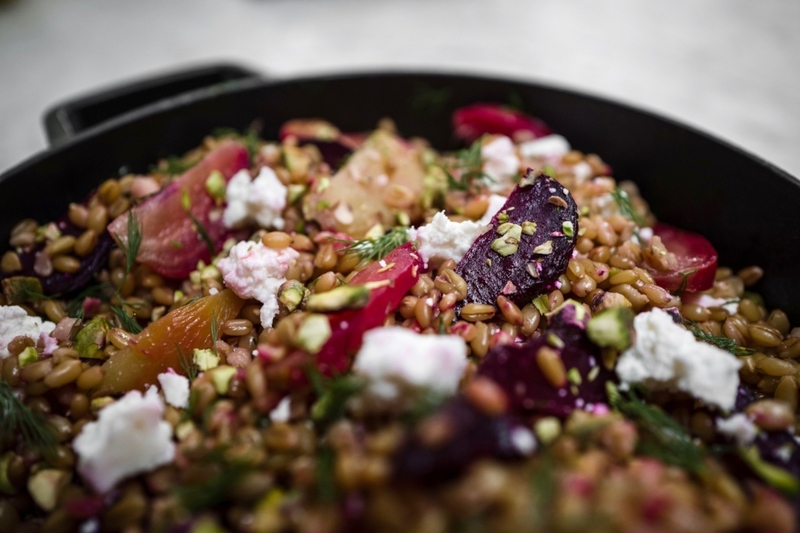 For this freekeh recipe with roasted beets and feta, I use a heavy bottomed oven-to-table sauté pan with a tight fitting lid that doubles as a serving dish. It’s my essential bit of kitchen kit. Multi use to the extreme, I use it for everything from cooking grains to baking crumble, to roasting chicken or meat, to slow cooking sauces, to sautéing or steaming vegetables, to toasting nuts and even baking cakes…….the list goes on. So while this is a wonderful recipe to have either at room temperature or warm, on the side or as a main dish, I encourage you to write your own unwritten part before you start. As a little guide, each component can be made in stages with the cooked ingredients hanging out together in the fridge until you are ready and made and served in this single style of pan. The unique personalised details of procuring, planning, timing and kitchen equipment are up to you. They create an individual blueprint, often tricky to instruct in a written recipe but leaves a space for you to make the complete formula your own and thus write your own segment. Please share your pre-cooking process with us. It will undoubtedly inspire and enhance our techniques when creating meals for ourselves and those we love. Note: The beets can be roasted a few days before, as can the nuts and the freekeh will happily sit in the fridge alongside the other ingredients until you assemble if you don’t have time to make it on the day. Critically, each of these stages can be made in the very same heavy bottomed sauté pan with a tight fitting lid. The nuttiness of freekeh marries perfectly with the sweetness of the roasted beets and salty freshness of the feta, making it a perfect side for roast chicken and fish or ideal on its own for lunch. If you can’t find freekeh, this works with any grain such as spelt, quinoa, farro, brown rice or barley. If the beetroot still have their leaves attached, cut them off at the bottom and keep to one side. Wash the beets, gently rubbing off any remnants of soil, keeping the skin in tact. Line the bottom of a sauté pan (we love our Crane Cookware pan) with a thin layer of salt to sit the beets on. Rub the beetroot with a little olive oil, and place on the salt in the pan, cover with the lid and cook in the oven for approximately 45 minutes until the beetroot are tender but not soft. When the beets are still warm, gently rub off the skin (this is one of the rare occasions we use gloves) and allow to cool completely. Rinse the freekeh thoroughly in a sieve. Place in sauté pan, cover with vegetable stock or water and add a good pinch of salt. Bring to the boil, stir one last time and cover. Turn the heat down to low. Cook for 20 minutes, and turn off the heat. Leave covered and to steam for another 5-10 minutes. Do not be tempted to lift the lid! While the freekeh is cooking, toast the pistachios in a frying pan, or roast in a 180C oven until fragrant and lightly browned (about 5 minutes on the hob and 10 minutes in the oven). Roughly chop. Once the freekeh has finished cooking and resting, remove the lid and allow the steam to escape. Add the sherry vinegar and stir through with a fork. Add a tablespoon of olive oil if necessary. Cut the cooled beets into wedges (we usually get 8 wedges out of a medium sized beetroot). Add the wedges to the freekeh and the beet tops (if using). Stir through the rocket, feta, pistachios and herbs just before serving.